The Hobie Mirage 180 with turbo fins gives you hands-free propulsion in both forward and reverse. The twin underwater turbo flippers propel you with surprising speed. 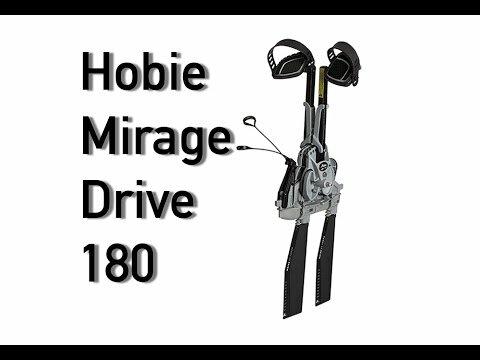 The new MirageDrive features Hobie's MD180 shifting technology to go from forward to reverse in a moment. The new Mirage Drive still features the popular Glide Technology so you can pedal faster, more efficiently. The turbos fins provide a larger surface area for maximum speed. The pedal-drive system on the Hobie Mirage kayaks makes it a great choice for anglers, photographers and anyone who would like their hands free while in their kayak. Features Turbo Fins and neoprene foot pads and self centering pedals. Love the new 180 mirage drive! It was used in very rocky sections on Narragansett Bay. Very effective when fighting Stripers in tight areas. The drive "almost" fit perfectly in my 2012 outback. A little improvising, and now it's perfect. Well worth it!! Love the new drive!! The reverse came in handy in rocky Narragansett bay. I did use it a few times when fighting Stripers. It definetly has more power than my old "flexible" fins on my older drive. I do make sure that the fins are straight down before engaging the reverse function. Very smooth!! Couldn't ask for more on this drive. Fast and with the reverse drive with easy pull, lets you go reverse in instant. Not like the native propel where there's a lag. I love it and highly recommend it for someone who wants to upgrade and wants a reverse drive. The drive works great. Having reverse on my kayak help when trying to take photos of wild life. Much quieter than trying to paddle back to get the shot. Q: Do you know when the parts to retrofit our 2016 mirage drives with reverse will be available? Hobie PR has said they will be available in 2017. A: Thanks for the question to ACK! These will likely be available later in 2017. They are in the process of designing an upgrade kit for the older drives. Q: Will the MD180 drive fit 2011 Hobie Outback? A: Yes, the MD180 Drive-Turbo fins should fit on your 2011 Hobie Outback. Q: Are the sprockets in the Mirage 180 Drive V2 replaceable if teeth shear off? Does the entire spine need to be replaced or can the sprockets be replaced? Q: I have a 2015 Hobie Pro Angler 12. Will the Mirage 180 Turbo work (fit)? A: Hey there! Yes, the Mirage Drive 180 with turbo fins will fit with the 2015 Hobie Pro Angler 12. Q: Are these faster than the the previous GTT drives or just purely for reverse? A: The 180 just gives you the ability to quickly go into reverse. Q: I read Hobie may have an upgrade kit to add the reverse on the 2016 Mirage Drive. If so is it available yet? A: Unfortunately this is not available yet, and we do not have a ETA on when this will be available. Please let us know if you have any other questions! Q: What are the dimensions of the paddles? Is there any upgrades for the paddles? How would one know what version they have of the 180 drive? Q: Will this Hobie MD 180 drive fit a 2013 Hobie Pro Angler? Thanks. A: Yes, this drive will fit into any Hobie mirage kayak. Q: Will this fit a 2012 Hobie Pro Angler? Thanks. Q: Is this the new 2018 v2 version? Q: Have a 2012 hobie oasis, will this 180 drive fit? Q: Do you know if this would fit a 2014 Mirage Revolution (11 ft, if that matters) Thanks! A: Thanks for your question! This will fit the 2014 Mirage Revolution!